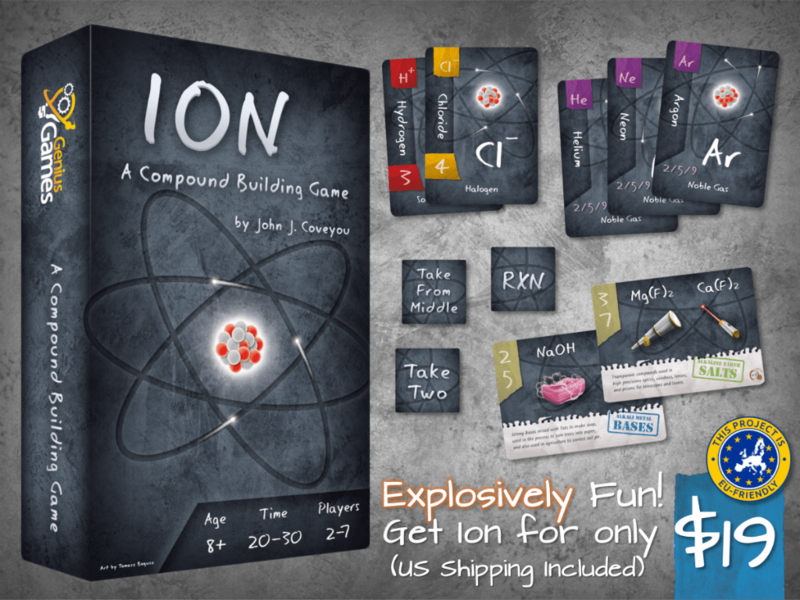 Ion: The Compound Building Game combines card drafting with a goal-achievment system that has players trying to build their own chemicals to score as many points as possible. Each player starts with a handful of eight cards of Ions or stable Noble gases. During each round, the player will pick one card and pass the rest to the next player. The chosen card is then placed face up in front of the player. These face up cards are then used to form ‘compounds’ by combining positively charged ions with negatively charged ones; the kicker is that the two have to balance, so a Calcium with +2 charge will need to be bonded to two OH Ions since these only have a charge of -1 each. The exceptions are the Noble gas cards, which cannot be combined with anything else. Cards are chosen and passed in this manner until players go down to three cards each. At this point, each player selects one more card, then the remaining two are discarded. Once this last card has been placed face up in front of the player, the turn is over. The game is played over three turns, with each player resetting their compounds between turns. So why are you doing this? Well, each Ion has a points value which will only count to your score at the end of the turn if that Ion is part of a stable compound; a +2 charged Magnesium card won’t score if, at the end of the round, you only managed to combine it with a -1 Fluorine card. Again, the exceptions are the Noble gas cards, which will score depending on the sets you collect: get all three and you earn a massive nine points, but only get one and you are lumped with a measly two. It makes the Nobles easy to score with at a low risk, but they only get big numbers if you manage to get the lot. To make each round different, players are also given additional Bonus requirements to attempt to garner some extra points. For example, a player may score an additional 2 points if they manage to make the Sodium Fluoride compound, or 5 extra points if they also make Potassium Fluoride. These bonus cards add some direction to the game, as players will now be scoping out what they need to do to obtain those valuable compound bonuses. As a turn develops, it adds that frisson of tension as you try to second guess what the other players will take from the ever-depleting hands of Ion and Noble gas cards. These made Ion ‘a game’ for me, as without them it was just a simple solitaire race to complete more compounds than everyone also at the table; card choice becomes far more relevant, both to achieve your own ends and to stymie the plans of the other players. On top of the Bonus cards, each player is given a set of chits (action tokens). These allow the player to perform additional actions, including taking two cards from a hand instead of one, taking a card from a center row (made available during each turn set up) and an ‘RXN’ chit which allows a player to rearrange all their current Ion cards or to steal an unbonded Ion card from another player’s selected cards. These chits aren’t without a cost; once used a chit is flipped to reveal a negative number. This is deducted from the player’s score at the end of the game. The negative values are also random, so one player may only lose two points for using their Take Two chit, whilst another may lose four. I found the chits an interesting wrinkle in the mechanics for Ion, but in every playthrough only one player didn’t use all their chits by the end of the game, and they ended up losing in the end. A canny player will only use a chit if they know the points they will score by using it will outweigh those lost; essentially, it’s relatively simple to risk assess their use and work around. I like the options the chits give but I don’t think the negative points have much meaning at the end of the game. The RXN chit can also cause a touch of NPE (Negative Player Experience), as a player can suddenly have their big score whipped away a turn early by a less than scrupulous opponent, causing a significant points swing. I can’t comment on the final artwork and build quality as the game hasn’t had it’s official print run yet. However, based on the current prototype version the graphics are functional and clear (we had no trouble interpreting the cards) and fit the theme in a ‘no frills’ kinda way. It won’t win any awards for pushing the boundaries of art, but then does it need to? This is a simple game of making compounds and it’s look would be enough for me to pull it off the shelf at my local FLGS and give it a perusal. Overall, I rather enjoyed Ion. It’s turns are brief and AP (Analysis Paralysis) is relatively low. The drafting mechanic is employed to great effect, especially in conjunction with the Bonus compounds cards, keeping player downtime to an absolute minimum. Scoring is simple and the rules can be taught in under a minute (no mean feat with my notoriously short attention span!). Ion also has a decent amount of replayability since it fulfils the filler role in a game library with it’s small footprint on the table and short playtime. 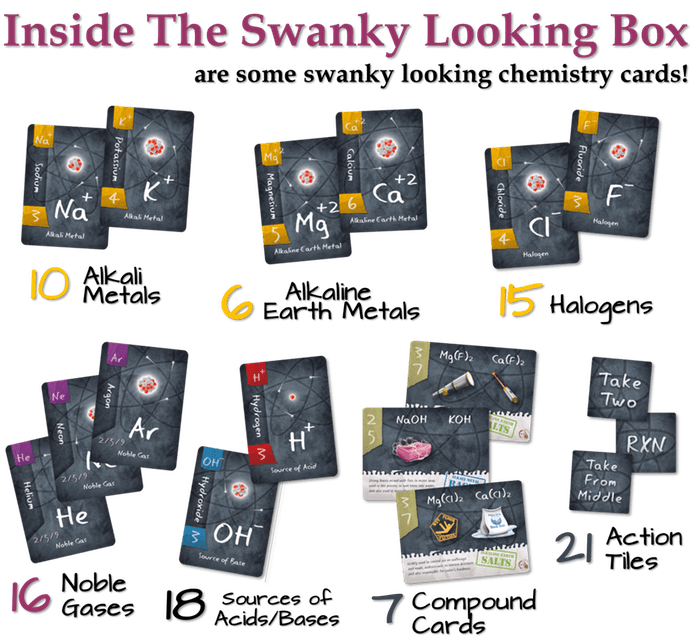 Some of the smaller mechanics seem a bit superfluous, but other than that Ion is a solid game with a robust and well-realised theme that will help to fill the gaps between bigger games or to wind down an evening of board gaming. Some of you may already know, but waaaay-back-when I trained as a high school science teacher (Physics) so this game immediately piqued my interest. We received a review prototype in the post and we were off to a promising start. The artwork is clear, uncluttered and focuses on the important points of the game. The rules can be explained to players in a minute or two and there was a good science theme to work from. As a game I found Ion to be quick, fun, engaging and replayable. My wife and I took Stak-Bots on holiday with us last year and we often played it at the table in bars or when just relaxing somewhere nice. I can definitely imagine doing the same with Ion. It’s a fast game you can set up in seconds, play in minutes and pack away just before your moussaka arrives at the table. The random draw element of the game (different ions in each hand) matched with the target compound cards is enough to ensure that it doesn’t become repetitive, but the game is simple enough that you wouldn’t have to remind yourself of the rules before you start playing, even if it’s been a while. In fact, once we’d gone through the rules the first time, we only went back to the rules once to clarify something and we were pleasantly surprised to find that the answer was there, it was clear and explicit, just as a rule-set should be. The science of the game is sound at a certain level. It’s not the most effective way to teach this subject because I imagine most learners will be focussing on the game rather than the content. However, this is a great way to reinforce the concept once it’s already been taught! Reinforcing a subject is a struggle because most students don’t want to repeat something they’ve already learned; however Ion does this in a pleasant, and fun way so students probably won’t even realise it’s happening. Simple things like incomplete molecules don’t score (they don’t form at all) or Noble Gases not bonding to anything at all are all good reinforcements of things they’re already learning in the classroom. In summary, would I get it? Definitely. For $19 (~£12) on Kickstarter it’s a great price for a fun game. It also let my wife (a chemist) feel smug that she knows more about this topic than me.